Andy and Michelle have the communication skills down pat. Especially when it comes to educating others about the sport of adventure racing. You can hear it in their voices and read it from their gestures – not only do they love going point to point, but they believe you’ll love it too. This past Sunday, Andy and Michelle, armed with a lean, visual presentation, spent some quality time with one of the Team’s most valued sponsors – Spokes, Etc. Twenty or so Spokes, Etc employees huddled together with pizza and beverages after hours to hear what Andy and Michelle had to say. 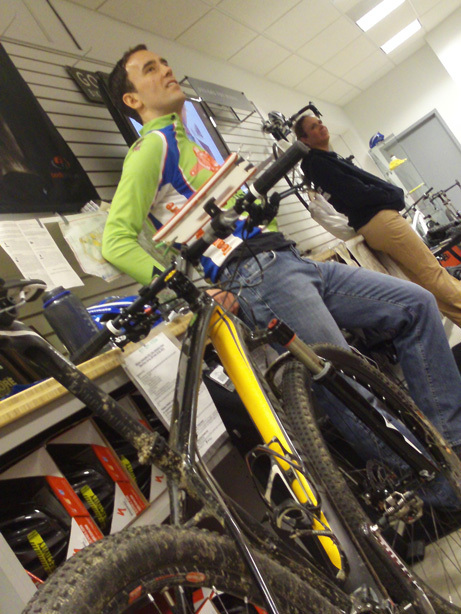 While experts in all-things-bicycle, it turned out that many Spokes, Etc employees were not as familiar with the ins and outs adventure racing. Employees knew that mountain biking was a component of the sport, but didn’t know the varied lengths of races or even the degree to which strategy impacts competition. Andy and Michelle as well as other Team members provided insight and experiences. What’s more, employees learned the needs of and gear favored by racers. Spokes, Etc wants to position itself as a retailer that is not only capable of outfitting new and existing adventure racers, but known by many for this capability. It was discovered during the evening that several Spokes, Etc. employees had signed up for the Adrenaline Rush 12 hour adventure race hosted by Andy and Michelle’s Adventure Addicts Racing company. Naturally this brought smiles to Andy and Michelle and to the Team, but it also encouraged other Spokes, Etc employees to consider racing in future adventure races. Team Halfway There is committed to building and maintaining partnership with its sponsors and their stakeholders.